This wiring is up to code, right? The accommodations could most kindly be described as basic. But hey, there was indoor plumbing, electric light, and a woodstove. 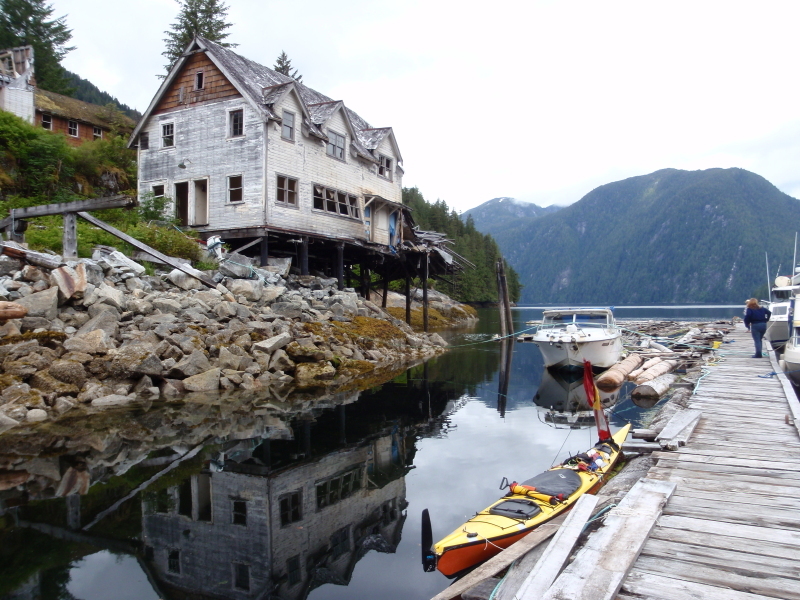 I shared my cabin with a couple of Real Men™ from Kitimat (one was a pipe line fitter; the other a drywaller). You could tell they weren’t quite sure what to make of a fleece-wearin’, tree-huggin’, cappucccino-sippin’ kayaker. But then the conversation turned to guns. Though I didn’t have it with me on this trip, I own a shotgun and could talk plausibly about the right rounds to use for bear defense. You could see my man-cred rising in their eyes. Eventually, I told them this story. That sealed the deal – I was a Real Man after all. Beer circulated. They reciprocated with a few bear tales of their own that were easily the equal of mine. Male bonding was complete. Once my clothes were hung to dry, I joined another couple of visitors for a tour of the generator house. The hydro-fed turbines still power Butedale after a century in service. After that, I had pancakes and coffee with Lou in his office/kitchen/workshop. 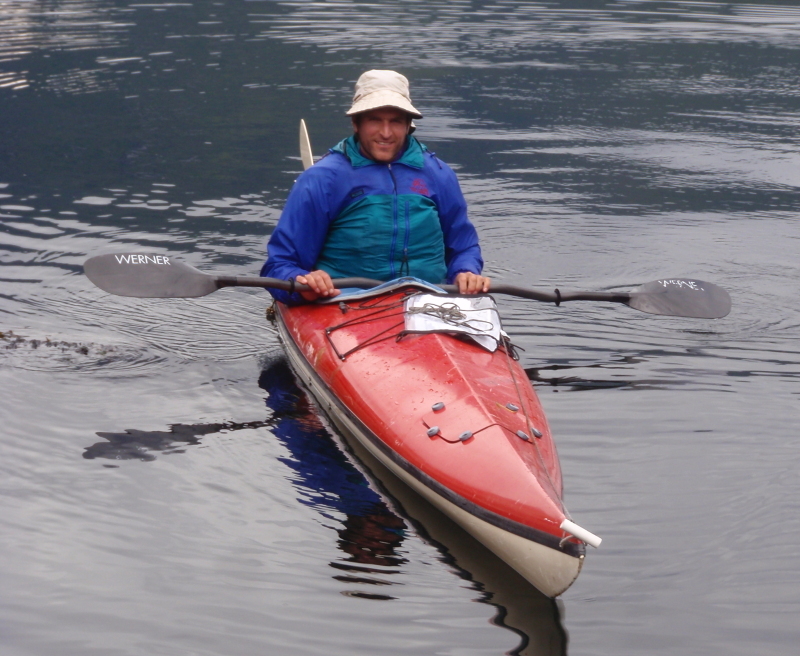 We were joined by Andrew Linger, who stopped in on his kayak trip north. In the early evening, I fired up the woodstove in the cabin. 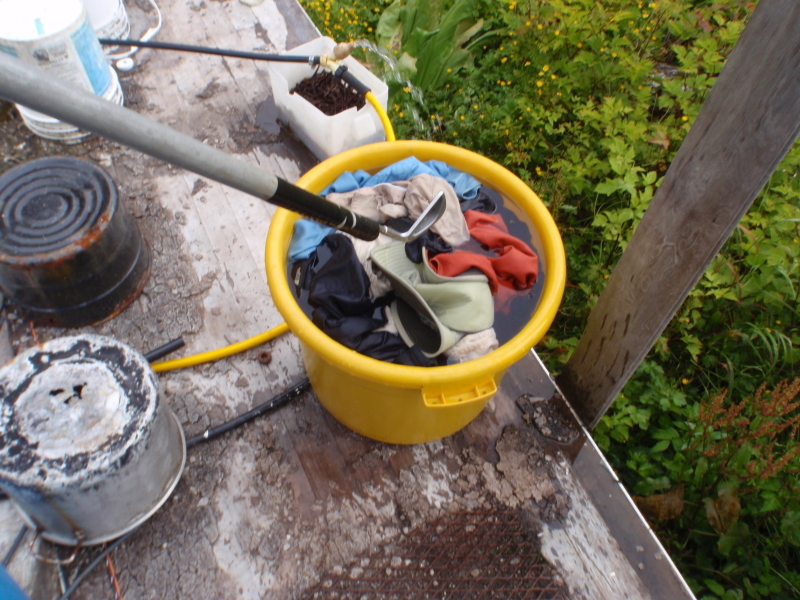 This was both so my laundry could finish drying (it had been cool and cloudy all day) and so my fishing cabin-mates could return to a warm hut after a cold day on the water. My completely uncalculated kindness was rewarded by being invited to join them in a feast of fresh-caught crab. The day started warm and hazy – enough so that I put on sunscreen before my 10:15 launch. But by the time I reached the Canoona River at 13:30hrs, it was rainy and windy. No bears to be seen – just a couple of First Nations fishermen laying out a net from a skiff. I plugged against a brutal counter current as I passed Griffin Point. 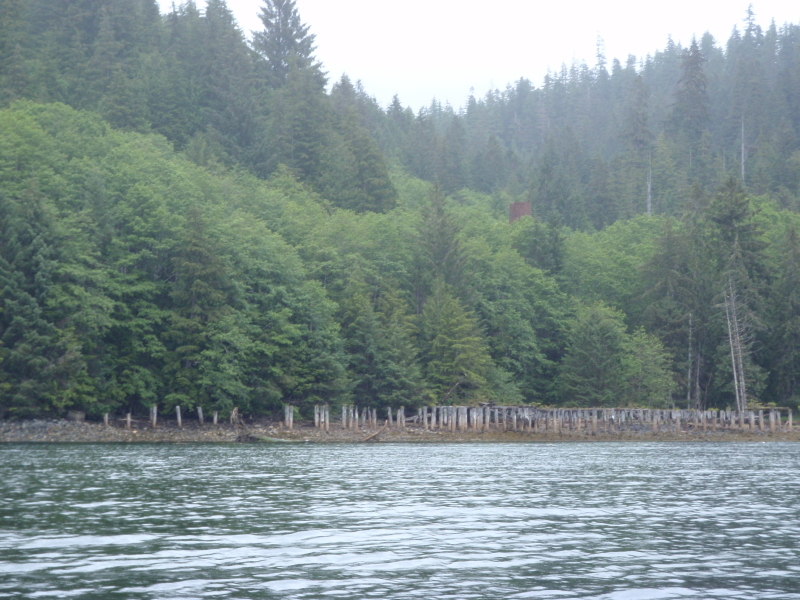 I took a brief detour into Swanson Bay, where all that remains of the once-thriving pulp mill town are pilings and a tall chimney. I got to Flat Point about 16:30HRs. 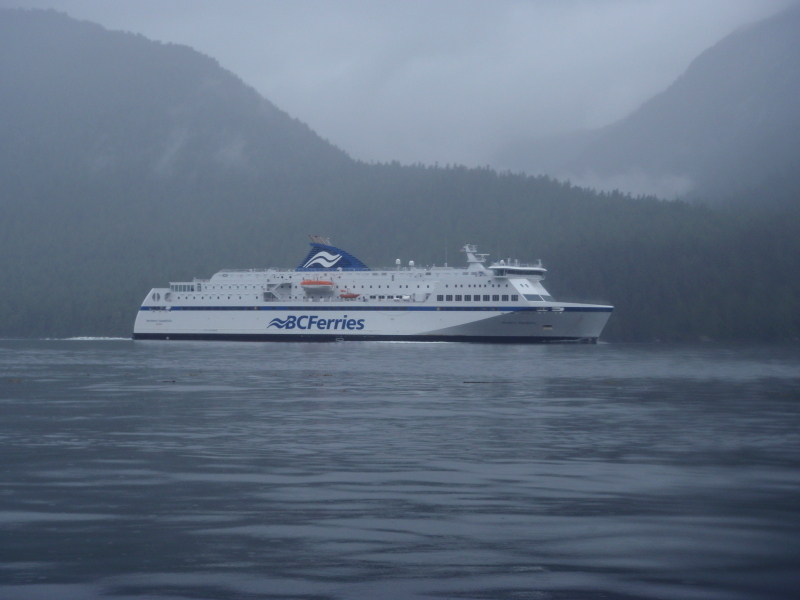 I had to delay my landing for a few minutes to allow the wake waves from the BC Ferry Northern Expedition to disperse. 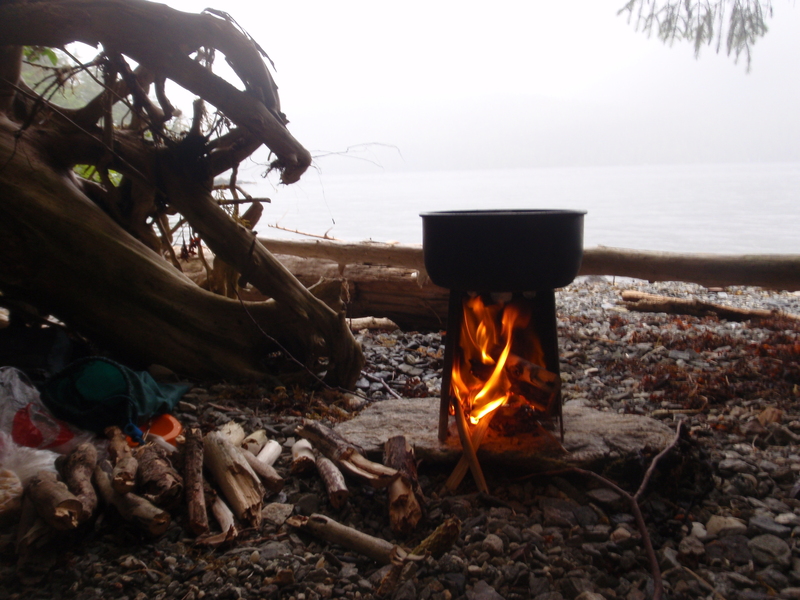 With the rain coming down very hard, I was glad – for far from the first time on this trip – of my full size tarp and of the Neufeld woodstove, which warms not only supper, but also body and soul. By getting up at first light, I was on the water for 8:30 the next morning, which was a Sunday. 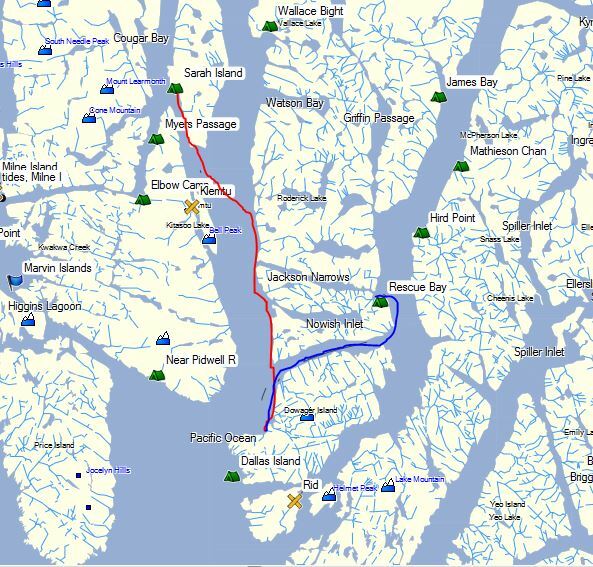 I’d run the sums the night before – with 22ish nautical miles to go, I could make the 18:00HRs ferry out of Klemtu that day if I kept up a steady 3+ knots. 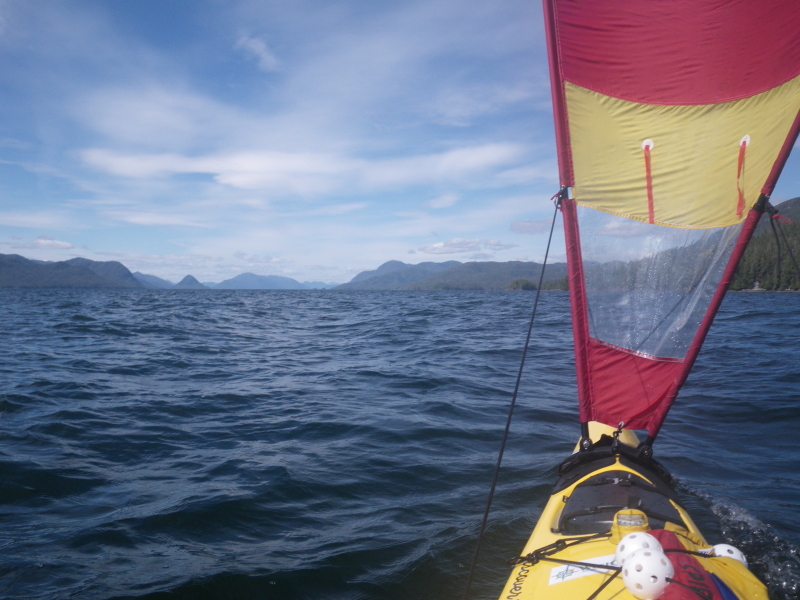 (My original plan had been to take out from Bella Bella or Shearwater that coming Friday, but I was rather sick of rain and was missing my wife badly, so the idea of an early return appealed.) I rang down for full speed from the engines and made 4+ knots for more than an hour. Then the south wind, counter-currents and reality set in, slashing my speed to less than 2 knots. I had to let go of the idea of an early out, since maintaining high speed in those conditions seemed a sure-fire way to wreck my wrists. 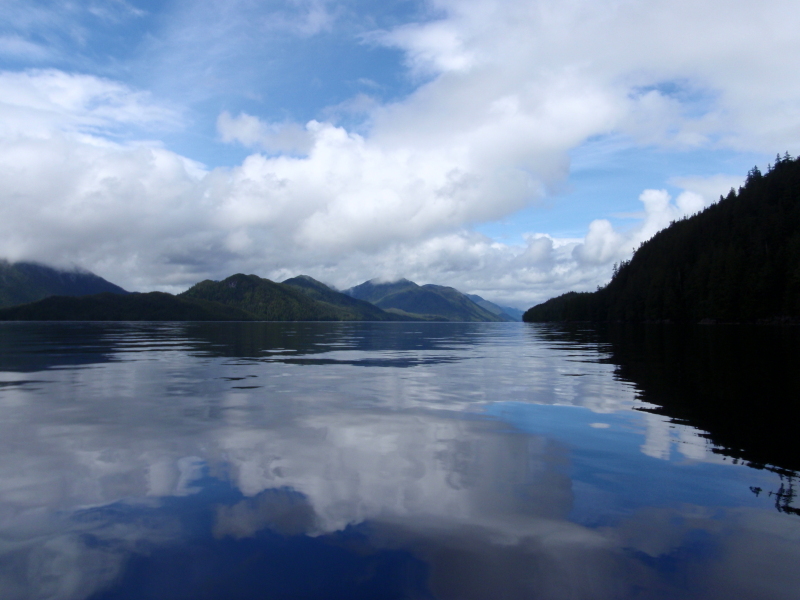 Back to Plan A.
I pulled into the bay at Sarah Island at 16:30, greeted by a crowd of curious seals. The tent sites here were large and lovely – the site seems to be used by either a tour company or possibly by the First Nations for one of their Rediscovery programs (basically taking the young folk out on the land and having the elders teach them some traditional skills and instill a sense of pride in their heritage. One of the most grounded and together teenagers of any culture that I ever met was a “graduate” of Rediscovery.) 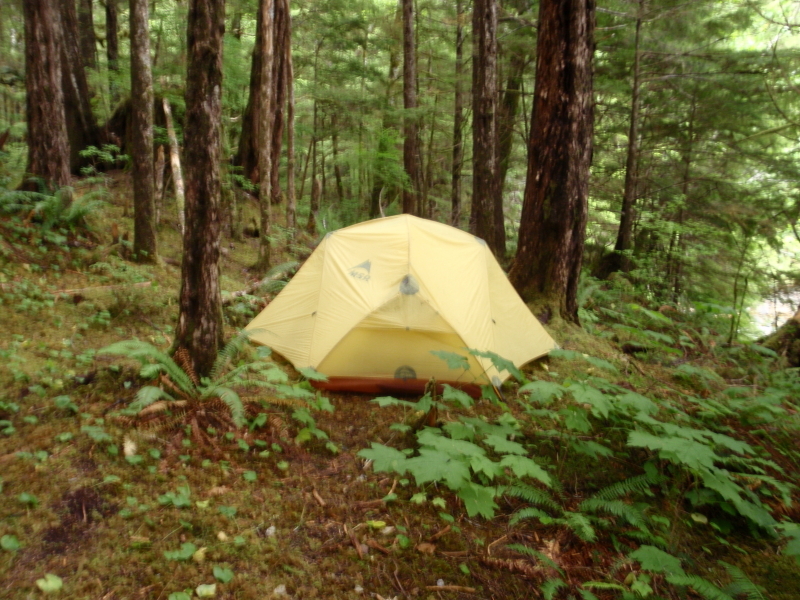 My one complaint was that a cascade of cold, damp air accompanied the stream down from the surrounding hills, creating condensation in the tent even though it was sunny outside. A memorable day for a lot of reasons, including that it was the first day of the trip I had all-day, full-on sunshine. 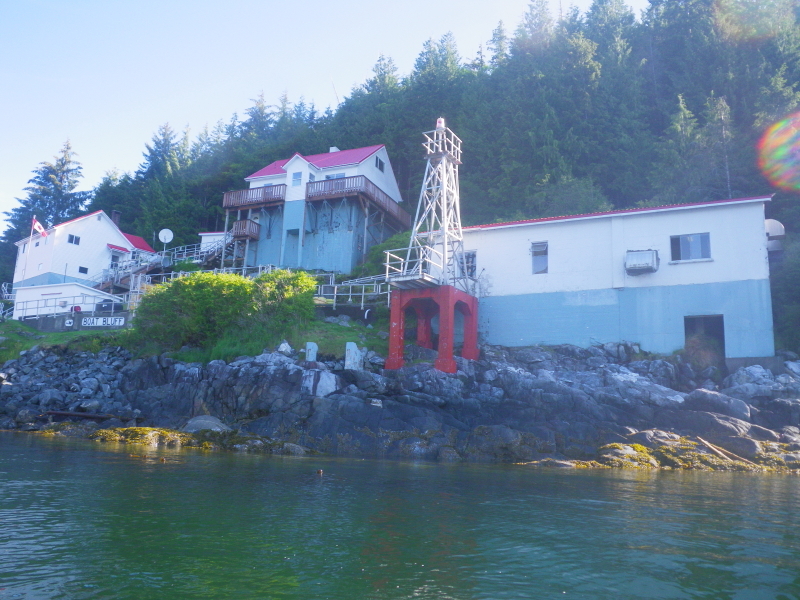 I ran down the west side of Sarah Island in the calm cool of the early morning, passing Boat Bluff Lighthouse and completing my loop around Princess Royal Island. By 11AM, I crossed over to Roderick Island, and cruised down its west coast in the shade. The flooding tide was being sucked south to pour into Jackson Passage. With that current slingshoting me along as I admired the rocky cliffs and waterfalls, it was some of the most perfect paddling of the trip. But once past Jackson Passage, I was bucking the tide again. 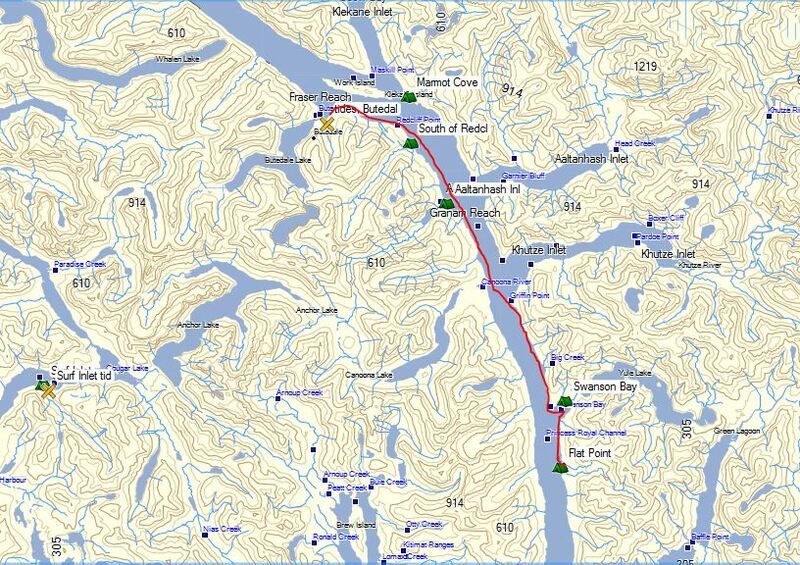 All went well until just after I’d crossed Oscar Passage to Dowager Island. Then the wind really picked up from the southwest. With the full fetch of the open Pacific from that quarter, it quickly brewed up big seas, which bounced off the portside shore to create brutal spilling claptois. After clawing along for what felt like ages, I bolted ashore on a little beach at the southeast corner of Suzette Bay to refuel and consider my options. 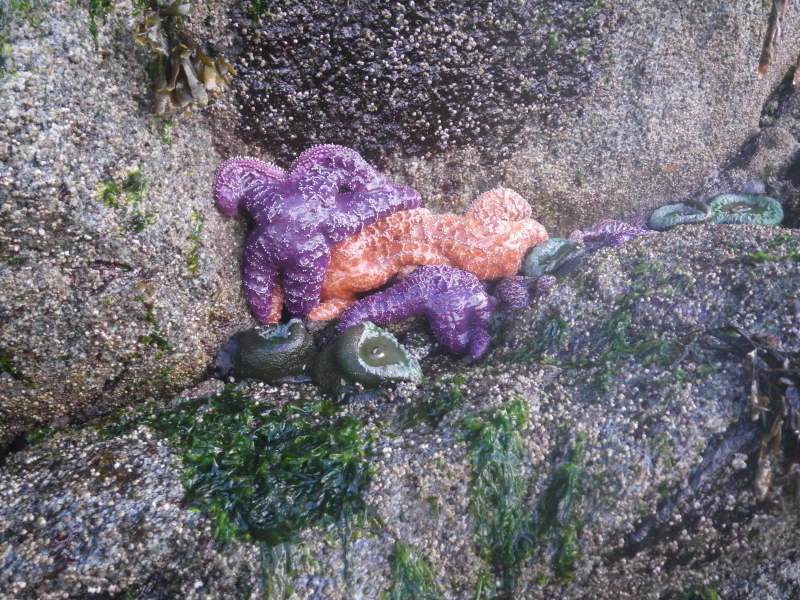 Camping there wasn’t one of them – the barnacle “depth gauge” on the rocks made it clear my temporary refuge became seafloor at high tide. The temptation to try to tough it out to Dallas Island, so achingly near, was strong. But a little thought made it clear that the already marginal seas here would be even worse on the exposed outside of Keith Point. And an honest self-assessment revealed that I had minimal energy reserves for coping with a capsize or other crisis. Over the years, I’ve enjoyed reading Sea Kayaker magazine’s (sometimes literal) accident post-mortems, but I never had a desire to be featured in one. Clearly a retreat – no, make that a “strategic rerouting” – was called for. So I headed back north. Yet again, my sail was my friend – it let me make my run before the ever-rising wind and waves much faster than paddling alone would have. Running back North. Swindle Island and Cone Island are visible on the left. With the seas on the beam, I took green water over the deck and sprayskirt several times, but got safely to the mouth of Oscar Passage after a short, scary ride. Just as I hove into the lee, I heard the blow of a surfacing humpback, and got a glimpse of him before he dove again. Though I’m not superstitious or religious, I chose to interpret this greeting as A Sign I’d made the right choice of route. 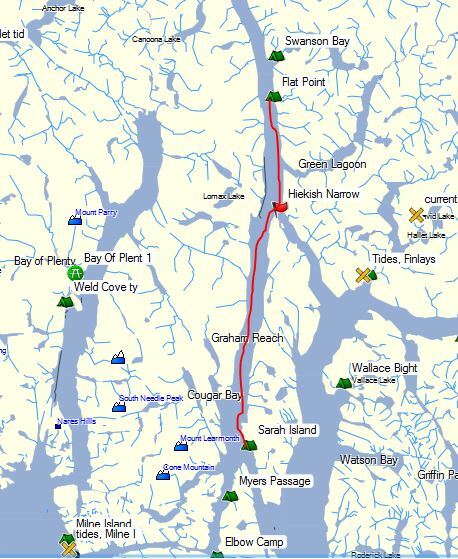 In the much lighter airs of Oscar Passage, I put up the second sail as well, and was able to move east through the entire passage at a respectable pace without paddling – very fortunate, since I was spent and needed a break. 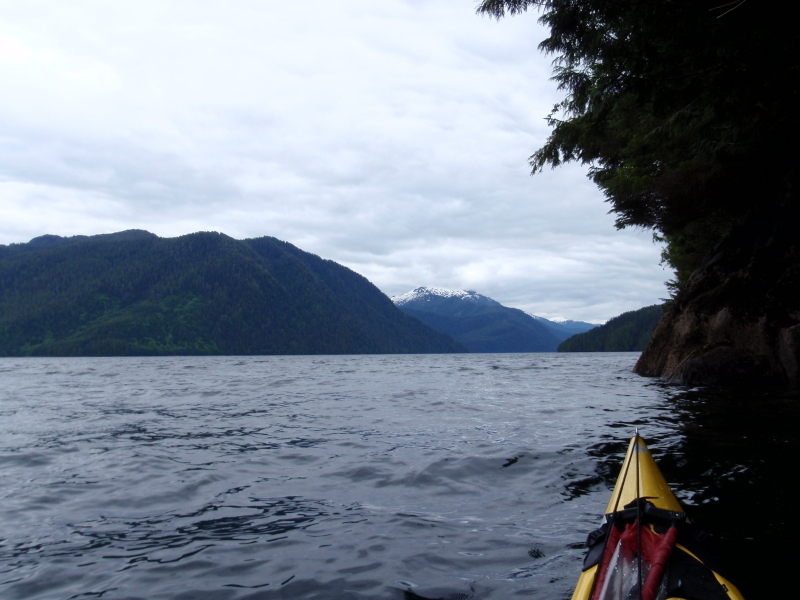 Once through the passage, I did have to paddle north to the aptly-named Rescue Bay, the nearest campable place I knew of. Two sailboats and a fishing boat were anchored there. I was glad of the proximity of people, even though I saw no one on deck and talked to no one. 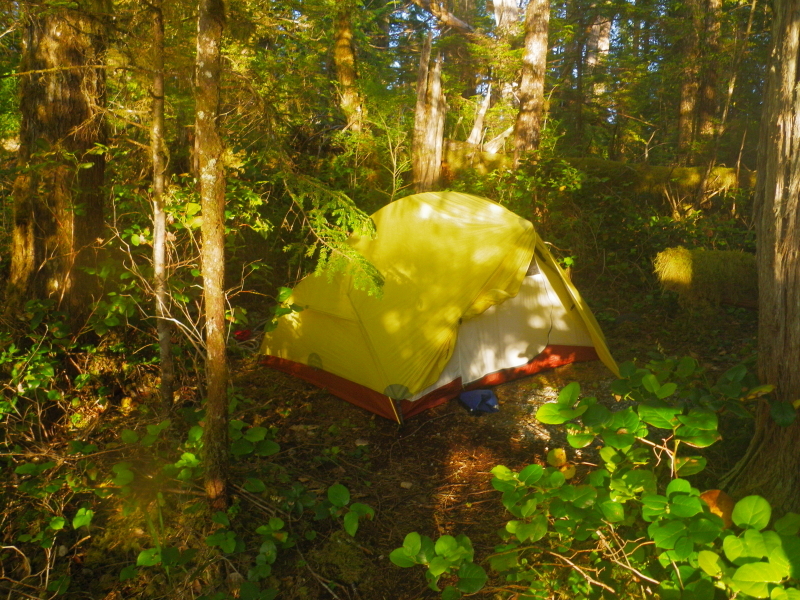 I landed on the small beach at 19:35hrs, found the tent platform someone had cleared in the bush there, and quickly had the Hubba Hubba HP up. I was so tired it was tempting not to eat – only the ease of the Trangia stove and the effortlessness of freeze-dried Sweet and Sour motivated me to do supper. As I lay in bed at 21:30HRs, I heard a guitar sing-along happening on one of the boats in the bay, marked more by enthusiasm than musical expertise. In my current mood, I found it charming in a loopy sort of way. What the neighbouring boats thought of it, I do not know. The first chapter of this story is here. The last chapter is here. 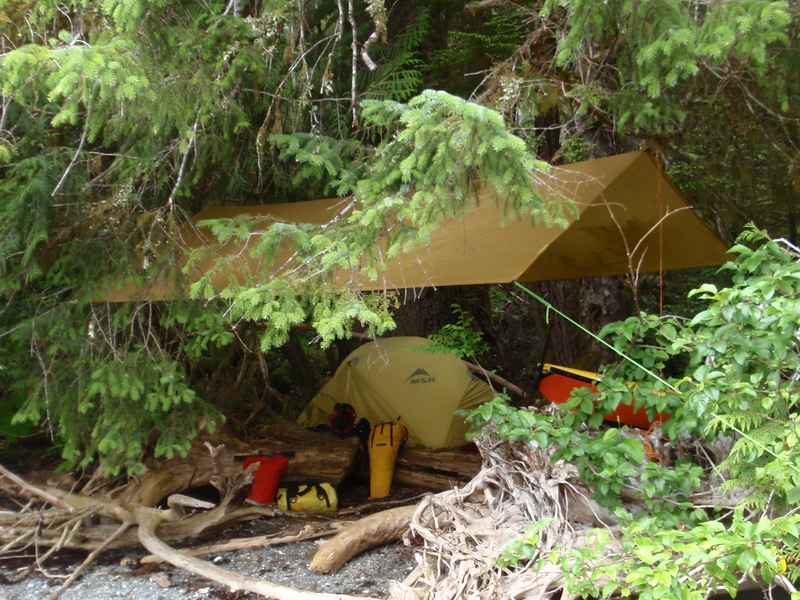 This entry was posted in Camping, expedition kayaking, kayak camping, kayak sail, Kayak Sailing, kayak touring, sea kayak, sea kayak sailing, Sea Kayaking, Tents and tagged BC Marine Trails Network, British Columbia, Camping, expedition kayaking, Great Bear Rainforest, kayak camping, kayak safety, kayak sail, Kayak Sailing, kayak sails, kayak touring, Kayaking, outdoors, Pacific Northwest, Princess Royal Island, Rescue Bay, Sea kayak sails, Sea Kayaking, Tents, woodstoves by Philip Torrens. Bookmark the permalink. there have been times I’ve been dealing with polar bears. I have a feeling at those times, pepper spray could turn out to just be a bit of seasoning for the bear’s meal. But, yeah, when I’m expecting “only” black or brown bears, I go with spray. Thanks for the kind words and happy, safe wilderness travels to you! Philip, Polar Bears are another matter altogether yes, based on what I know, have heard and read. For the most part they’re 99% predatory, though I stand to be corrected as each animal is unique I would suppose. You are correct, when one is “expecting” only Black Bear or Grizzly, by far and away “spray” is the best option given the complexities associated with personalities and whether behavior is being displayed as defensive, curious or predatory. Sometimes, there’s not a whole lot of time for us mere human beings to know those subtle differences.